Brown rats are, in many ways, the most common and successful species of rodent. They live on every continent except Antartica, and in all climates except the northern most parts of Russia, north-eastern Canada, Greenland, and select islands. They are also known as the “Norway rat”, “common rat”, “street rat”, “sewer rat”, or “wharf rat”. Its scientific name is rattus norvegicus (Norwegian rat) is cause for some misunderstandings as the species did not originate from Norway. Brown rats have followed humans to nearly every major city and town, bringing disease and pestilence along as they search for food and shelter. Brown rats are able to carry a number of pathogens. Some of the most well known of which are the bubonic plague, typhus, Weil’s disease, toxoplasmosis, and trichinosis. The can also damage and contaminate food as with their waste as well as the parasites which they carry. Rats can cause electrical fires by chewing through wiring and insulation and causing a short circuit, a habit which may be responsible for as much as 50% of farm fires. They prefer damp environments and will enlarge gaps in the walls and foundations, plumbing, attics, siding. 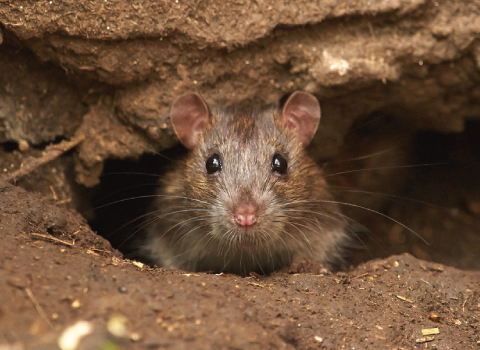 Brown rats typically burrow underground, near another structure which can provide overhead shelter. Like most rats, they are nocturnal and will remain hidden during the day if at all possible. If you see one during the daytime it may be a sign of a large infestation.